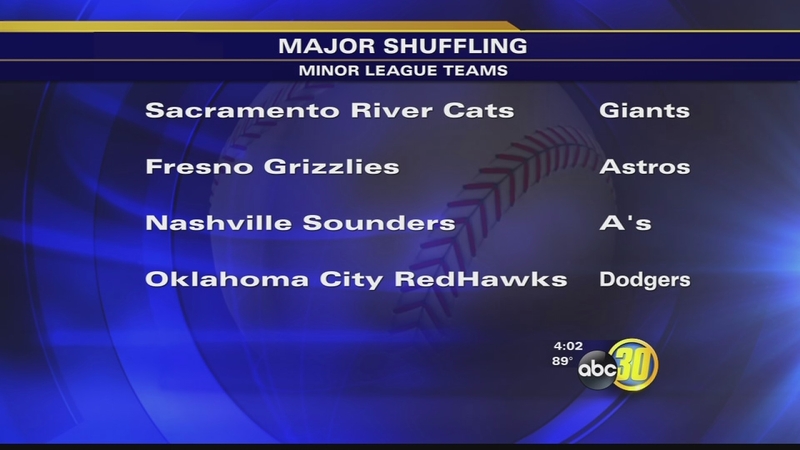 Rumors have swirled for months the Giants were going to pull their Triple-A team out of Fresno. It's now official -- the Giants are moving their Triple-a club to Sacramento. FRESNO, Calif. (KFSN) -- Rumors have swirled for months the San Francisco Giants were going to pull their Triple-A team out of Fresno. On Thursday it became official: the Giants are moving their Triple-a club to Sacramento. Now, Valley baseball fans will watch Houston Astros prospects works their way to the big leagues. "We have signed a two-year contract player development contract with the Houston Astros," Grizzlies Managing General Partner Chris Cummings said Thursday. Cummings' announcement ended the Fresno Grizzlies' 17-year partnership with the San Francisco Giants. The Grizzlies will keep the name but the color scheme now matches the new parent club -- the Astros. Paul Salazar's collection of Grizzlies and San Francisco memorabilia is mind-boggling. For die-hard fans like Salazar, the affiliation switch change is a giant step backward. "It was fantastic for us to see when they call the farm system or the kids. To see them play and then to see them on TV in the major leagues and producing and winning the World Series that was fantastic because we felt we were a part of that," said Salazar. Fresno Mayor Ashley Swearengin said in a statement, "The reality of life in Triple-A baseball is that while the line-up card is constantly changing, the fans are always the team's top priority." Giants gear has sold very well locally over the years. All-American Sports Fan owner Tony Adamo is also among the disappointed. "It's really a bad deal," said Adamo. "It's tough enough downtown with the new stadium and the economic impact on the community. We went from the best of worlds to I'm not going to say the worst of worlds but it isn't too far from it." But Chukchansi Park will soon be home to a very talented group of Houston Astros prospects. "We know going into the next chapter of baseball in Downtown Fresno we're going to be loaded with prospects and loaded with talent," Grizzlies Executive Vice President Derek Franks said. On top of that, Parker keeps his job. Despite the loss of the Giants affiliation, Salazar says he can't wait to watch future Astros play at Chukchansi Park. After all, it is still Triple-a baseball -- one step from the majors. The Grizzlies' front office announced the new two-year partnership with the Major League club. After the Giants notified Fresno that they were leaving for Sacramento, that realistically left three teams in the hunt to reach an agreement with our local team. In the end, the long-standing relationship between Cummings and Astros' President Reid Ryan sealed the deal. But since the Giants won the World Series in 2010, the Fresno club has used the term "farm grown" to link itself with a championship team. Grizzlies officials say honoring those players will not change. And they believe their relationship with the Giants in recent years will help them with the Houston Astros partnership moving forward. "We had a great 17-year run with the Giants. I mean we got to be a part of two World Championships, and had a lot of players come through Fresno," said Franks. "But I think that's the important part is that we've had a lot of great players come through Fresno that have used this facility to get to the next level and that doesn't change." Franks said the Astros' front office is happy with the dimensions of Chukchansi Park. They'll get a chance to see it first-hand themselves when they visit Downtown Fresno next month. The Grizzlies will keep the name but the color scheme now matches the new parent club -- the Astros.